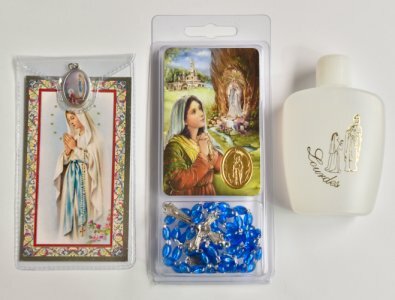 CATHOLIC GIFT SHOP LTD - Lourdes Water & Rosary Gift Set. > Novena Prayer Card to Our Lady with Medal. > laminated prayer card set with gold foil medal & Lourdes blue plastic rosary.